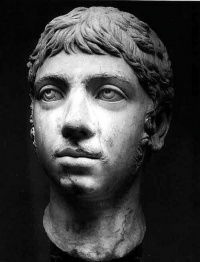 This page Roman emperor is part of psychopathology series. The Roman emperor was the ruler of the Roman State during the imperial period (starting at about 27 BC). The Romans had no single term for the office: Latin titles such as imperator (from which English emperor ultimately derives), augustus, caesar and princeps were all associated with it. In practice, the emperor was supreme ruler of Rome and supreme commander of the Roman legions. In theory, however, Rome remained a republic, the res publica, and the emperor's status was merely that of primus inter pares—first among equals. This legal fiction became increasingly meaningless as the emperors consolidated their power. However, it was maintained at least to a ceremonial degree until the very end of the Roman Empire. The Western Roman Empire met its end in 476 and the Eastern Roman Empire in 1453. Unless indicated otherwise, the text in this article is either based on Wikipedia article "Roman emperor" or another language Wikipedia page thereof used under the terms of the GNU Free Documentation License; or on original research by Jahsonic and friends. See Art and Popular Culture's copyright notice. This page was last modified 11:53, 11 October 2017.